The Atlanta Falcons had the worst defense in the NFL last year, ending up 6-10 despite boasting one of the league’s best QB-WR tandems in Matt Ryan and Julio Jones. Dan Quinn was the defensive mastermind behind the Seattle Seahawks during the last two years, when that defense led them to the Super Bowl twice, and an inspired choice to take over as head coach in Atlanta. 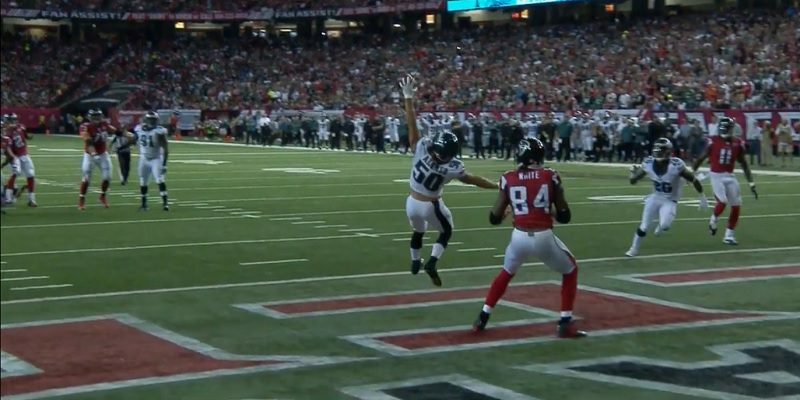 The Eagles obviously did study tape of Quinn’s Seattle defense last year, preparing for their game where Seattle completely shut down Philadelphia’s offense (139 total yards, and only 57 of those on the ground). The Falcons don’t have the defensive talent that Seattle does, of course, but the risk was clearly there. It turned out that Chip was right to be worried. Atlanta came out fired up, executing flawlessly on both sides of the ball. Julio Jones was named NFC offensive player of the week after racking up 141 yards and 2 TDs on 9 receptions. New offensive coordinator Kyle Shanahan moved him all around the field, and he caught passes from every starting point he visited. Quinn was also very familiar with the weaknesses and strengths of Byron Maxwell, the ex-Seahawk that Philadelphia signed for $63 million as a free agent to shore up their secondary. Maxwell was torched, giving up 10 receptions on 11 targets for 174 yards and 1 touchdown. The offensive scheme was clever, using max protection to give a great QB endless time to find his two great receivers (Jones and the older but craftier Roddy White). On defense, Quinn ended up using a variation of his Seattle 4-3 defense that mixes two-gap and one-gap techniques, moving his linebackers back a yard to better diagnose coach Kelly’s packaged plays. 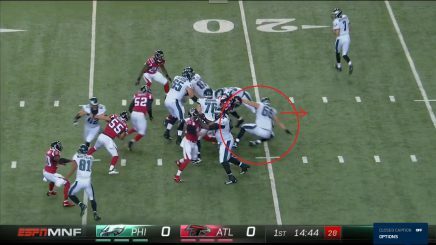 What hurt the Eagles most, though, was poor execution and weak OL play. TE Zach Ertz and WR Josh Huff did not turn around for (or, apparently, expect) first quarter passes from Bradford, leading to quick punts. The QB narrowly missed WR Miles Austin for a likely touchdown on the third drive, a deep bullet that was just a bit too far and off the veteran’s hands. And the run game suffered as Quinn packed the box, and the two new starting guards (Allen Barbre and Andrew Gardner) had a very rough first half. On the first run, Atlanta’s new DE Adrian Clayborn literally threw Gardner at RB DeMarco Murray, who had to wait for him to fly by before grinding out two yards into the line. Gardner improved in the second half, but Barbre remained a problem all game long. The defensive high point was ex-Duck LB Kiko Alonso‘s spectacular one-handed interception in the end zone, which drew immediate comparisons to Odell Beckham Jr.’s great catch last year. Chip Kelly and his coaches made excellent half-time adjustments. A de-rusted Bradford was 21-for-25 after the break, after 15-for-27 in the first half. Ten different Eagles caught passes, including all three running backs. Darren Sproles was fantastic, averaging 10 yards per play both running and receiving. And the defense at least slowed Atlanta down. The Eagles came back to take the lead 24-23 with nine minutes left in the fourth quarter. Atlanta hit a field goal to retake the lead, and Bradford led Philly on a 54-yard drive down to the Falcon’s 26 yard-line with two and a half minutes left. 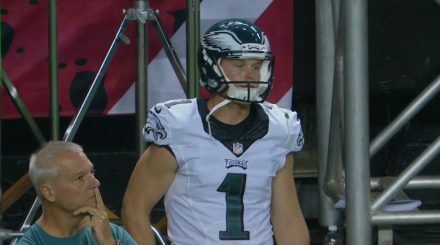 Facing 4th-and-1, Kelly uncharacteristically chose to kick a 44-yard FG instead of going for it — and K Cody Parkey missed. His weak off-season has now grown into a solid reason for concern — and a good reason for Chip to get more aggressive next time. The loss was heart-ripping but not without encouraging signs. Atlanta posed some unique problems, and the Eagles strategy of keeping starters out of the pre-season games led to severe rustiness. There will be concerns with the secondary, kicking game, offensive guards, and the running game, though, until proven otherwise. Game 2 is at home against the hated Dallas Cowboys — missing DE Randy Gregory, Greg Hardy, CB Orlando Scandrick and, most importantly, star wide receiver Dez Bryant. As good as Dallas is, the Eagles should win this game. Failure to do that would unleash the full force of Negadelphian negativity, and drop a ton of criticism on Chip Kelly’s head.